The human dimension of tragedy becomes traumatic when you have disturbing visuals flooding your consciousness and staying there. So be it the blurry images of the Doordarshan era of people jumping out of Hotel Siddharth Continental, where a roaring fire claimed 37 lives, distraught relatives stunned by the charred remains of the Uphaar theatre, where flames engulfed 59 people watching a film or the mother and child jumping out of the window of Arpit Palace Hotel in Karol Bagh to escape a choking inferno that killed 17, the shock element leads to an all-consuming rage at the owners of these properties for ignoring fire preventive and safety norms and playing casually with lives. Unfortunately, the rage doesn’t blaze into mass fury as the causes for these episodes remain the same — a short circuit here, a violation there and an overall negligence of standards to make businesses competitive. What is it about the Arpit Palace blaze that we didn’t really know through the chronology of such disasters in Delhi? 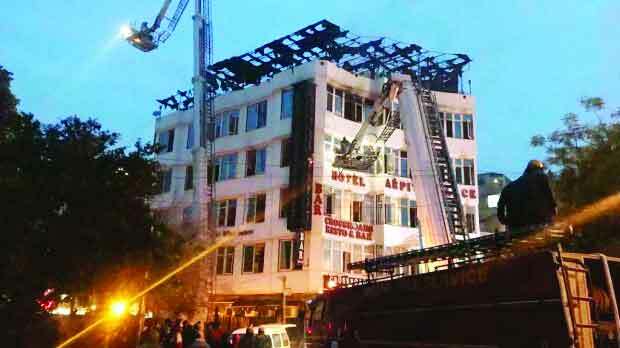 There is the very familiar version of it flouting construction norms, being a six-storey building, including one temporary floor, instead of the permissible four floors. Design changes that often overlook wiring and overloading circuits, the concealed ducting that is seldom checked for wear and tear, the lack of proper exits and containment protocols... the reasons remain the same. Of course, the Delhi Hotel Association insisted that properties couldn’t afford to be careless as licences were given only after inspection. But when it comes to on-site investigations, we know how they are easily manipulated at the local level. Just a week ago, a major fire broke out in a Noida hospital forcing emergency evacuation of patients but it was contained without any casualty. It spun out of control here. Hotel fires present unique challenges to fire departments and when it comes to safety drills, all categories in our city do not maintain the same levels of awareness, preparedness or response-readiness. Besides, hotels are occupied by guests who are likely to have little knowledge, despite signages, about the building’s layout, exit routes and alarms and may be asleep, as they were in this case, at the time of the incident. Then there is an element of panic which sets in, particularly in this latest episode where wood-panelled corridors fuelled the fire and trapped guests. Each hotel is different and standard operating procedures may not apply to properties which have limited access or lie adjacent to crowded neighbourhoods. Worst, seldom are middle-level or budget hotels pre-planned and mushroom later, resulting in distressing a system that was not designed to factor in hazards. But the only way to neutralise risks is to make sure that all fire safety equipment are working, there are periodic drills and checks in case of the slightest change to structure and the electricity grids. Sadly, risk assessment in our country is not a priority. Till the next incident shocks us.